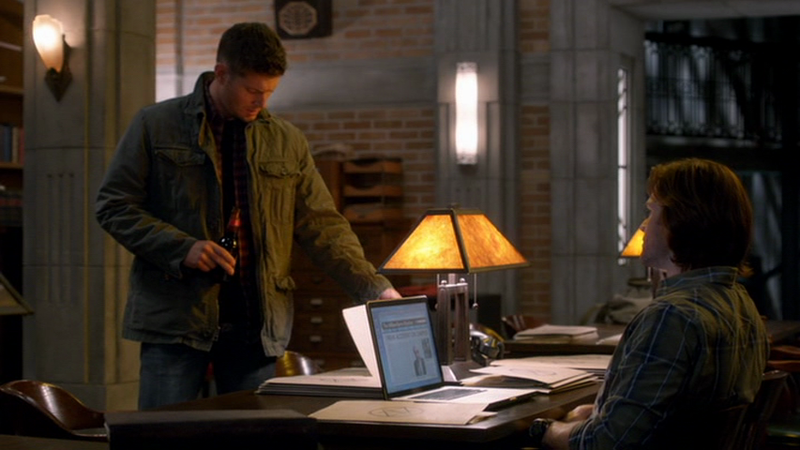 Dean’s Red Plaid Shirt of Angst is really what inspired this entire project. 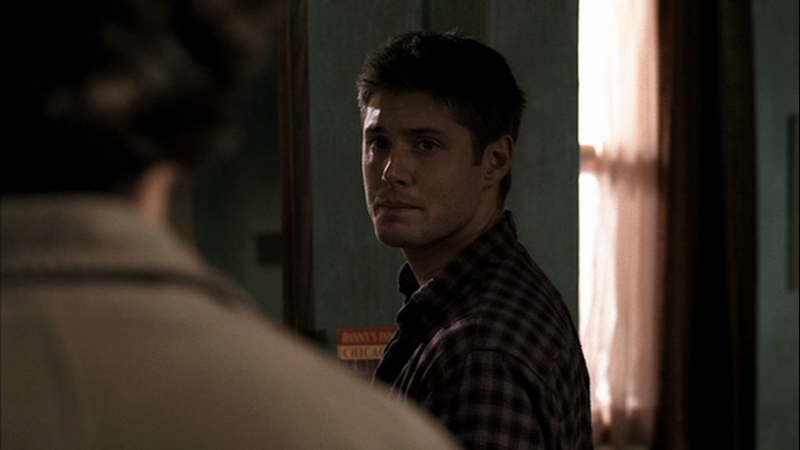 I noticed that more often than not, when Dean was having a “moment” he was wearing this red/grey plaid shirt. Yeah, I'm quite impressed with that myself. 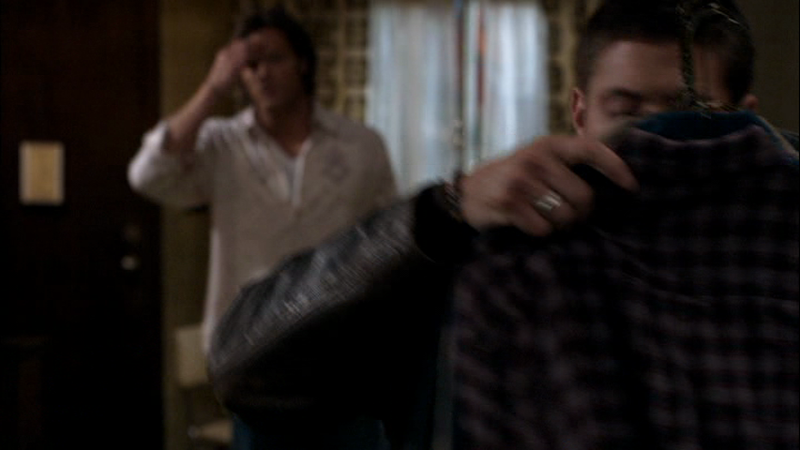 There's a few scenes that have Sam's shirts as props too. It's neat. 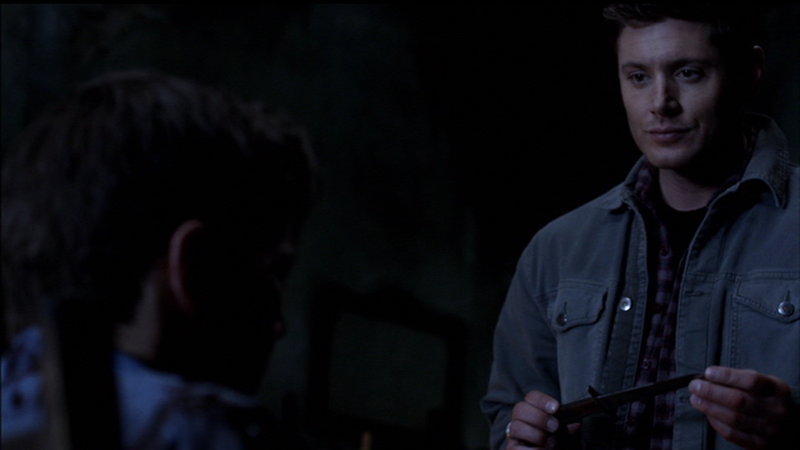 Also, I find it really interesting that the Winchesters take the time to hang up their clothes when they are staying some place. I don't travel nearly as much as them, and I tend to literally just live out of a suit-case when I do. I am amazed at what you have done with this whole If clothes could talk project - it's unbelievable! I'm kind of in awe that you actually paid so much attention and went back to write about it and provide pictures and references... wow. Kudos! And this little entry has been my favorite so far! 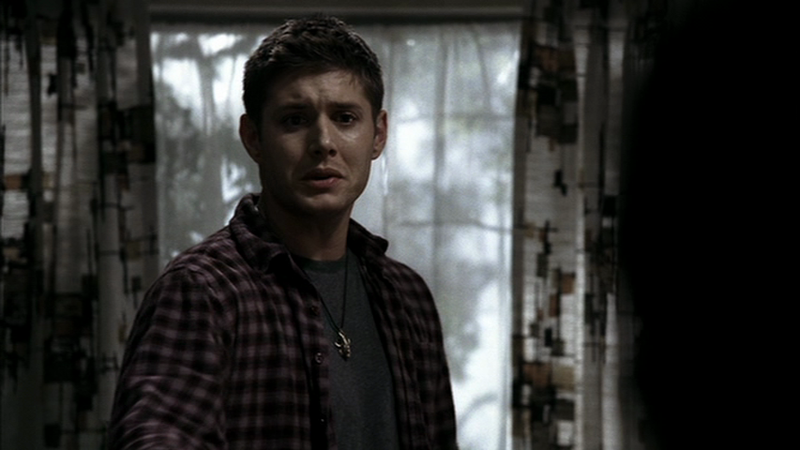 I love the pattern of this shirt being angsty for Dean! 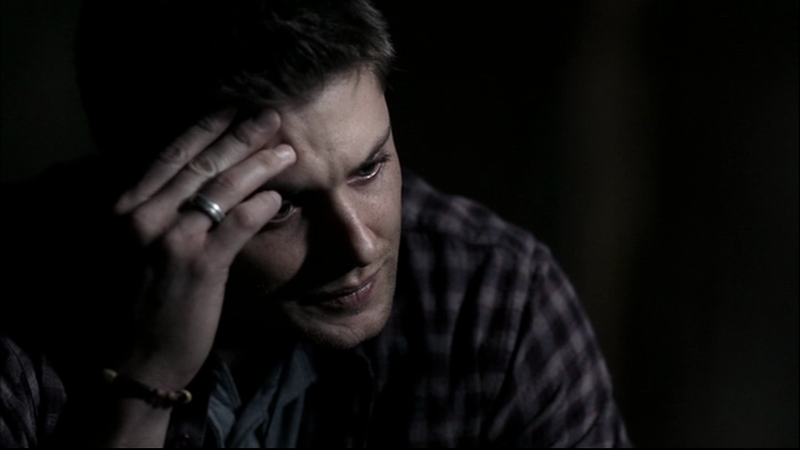 Arguably, EVERY episode of Supernatural ends up being angsty in SOME way...but Dean doesn't shed any tears in Provenance - nor does his chin wibble, so I count it as a non-angsty appearance ;) ...but yes, technically, it doesn't COMPLETELY break the pattern. 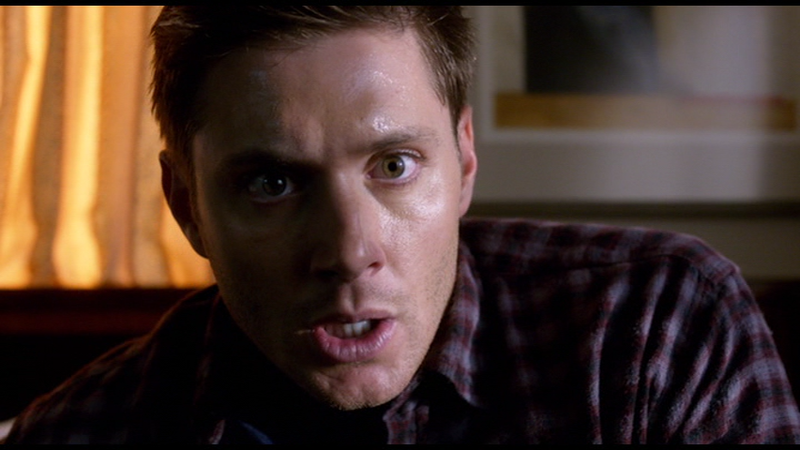 Oh, you got the red plaid shirt! Your label "of angst" is even the one I'd assigned it. Well done! A friend just told me about this. I am in awe of you for undertaking this massive project. Thank you so much for doing this! 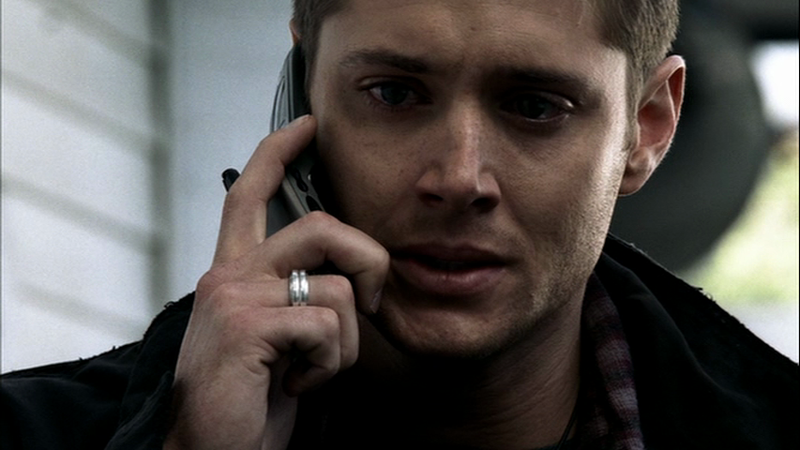 The Red Shirt of Angst is my all time favorite Dean shirt, and Sam's Brown hoodie is my favorite Sam piece, although I have a piece of the Angst shirt and also Sam's white/blue stripe from AHBL. They are my treasures now. The Angst and the Hoodie are have the most history of anything else. I really hope when the show wraps up they will auction the most important pieces for charity (and the amulet and other jewelry the guys wore). The fans will really show what we are made of with the money raised. Thanks again! You are Awesome! SQUEE! 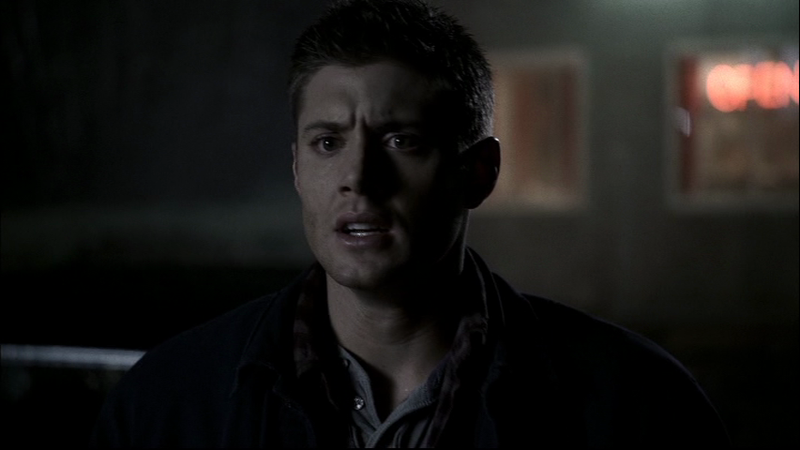 My favorite Dean shirt! Though I call it The Purple Flannel, but, that's only because it looks purple to me. Thank you for this entry, I hand't realized just how many appearances my fave shirt made on the show. I could only recall a handfull of episodes off the top of my head. 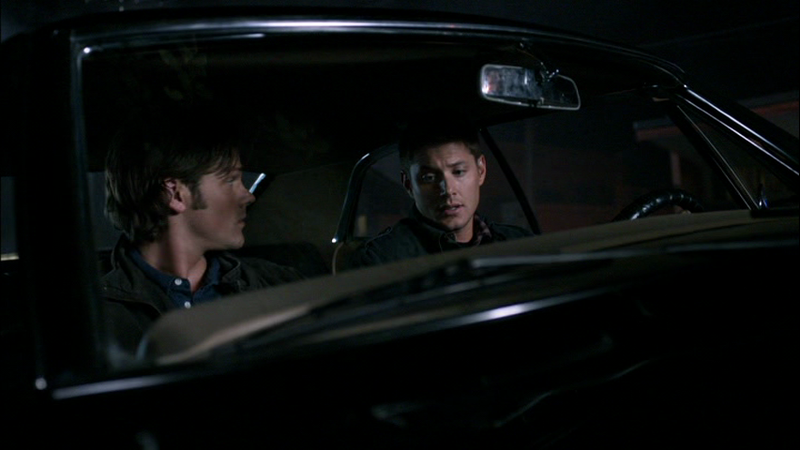 Dean/Jensen look sooooooooooooooooooooooo gooooooooooooooooooood in this shirt! :) It's really the shirt that inspired the whole project! 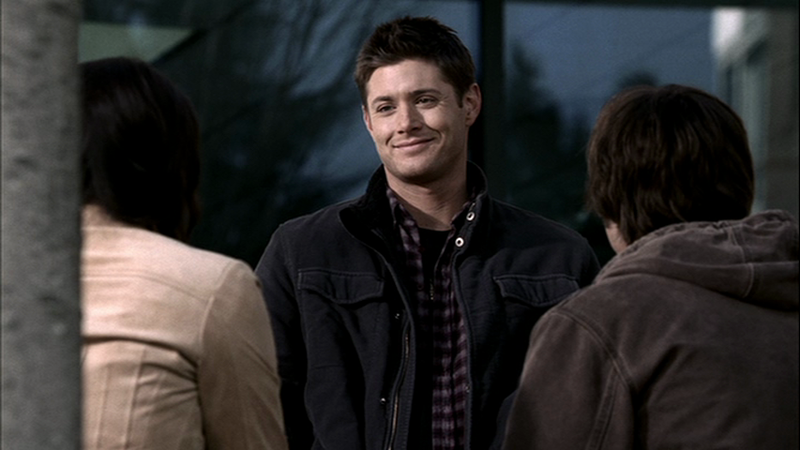 This is my favourite Dean shirt too. It's actually the one that inspired the ENTIRE project! 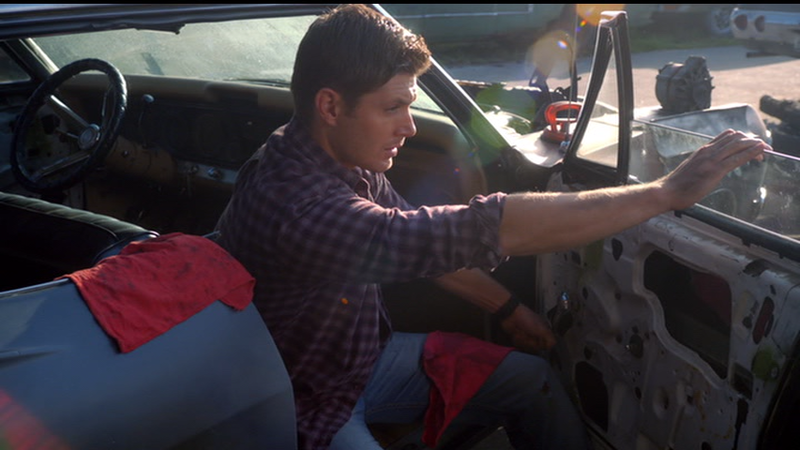 He was also wearing it in Meet the New Boss while working on the Impala. 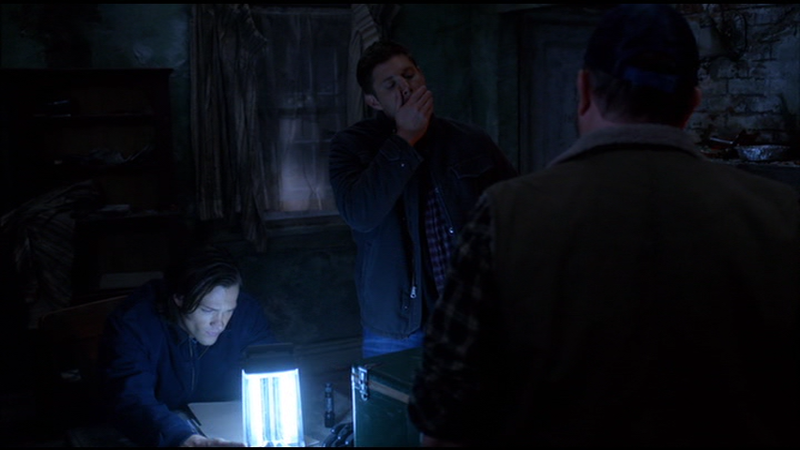 Continuing the theme, Sammy may be loosing him mind and they just lost Cas to the dark side. Very true!! I'll be adding that next fall (I like to catalogue the season all at once from the DVDs). I'm really happy that he still has this shirt. I love it! 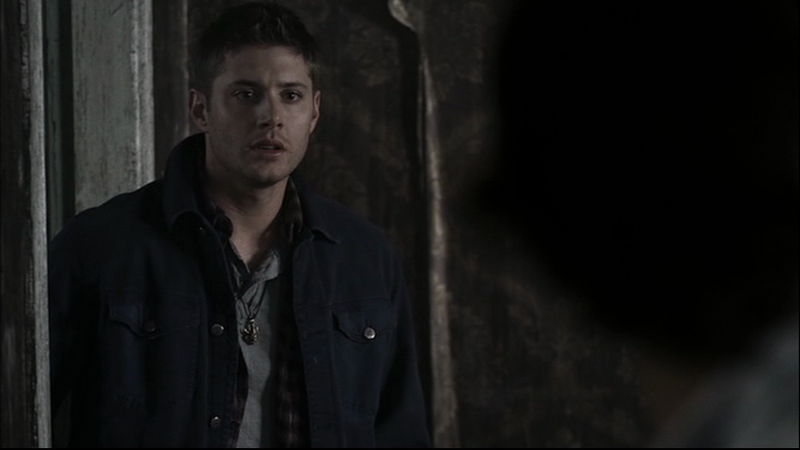 This is my favorite Dean shirt though I've always thought of it as The Purple Flannel because it doesn't look very red to me. 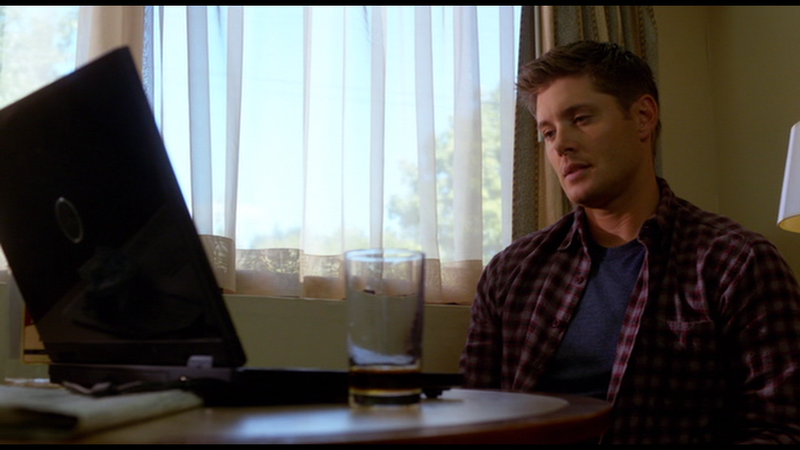 My desktop wp is a photo shoot promo-pic of Jensen in this shirt. Someone posted this on Facebook without giving you credit. Re: Someone posted this on Facebook without giving you credit. Thank you so much for doing all this work, you're amazing! I'm still working on getting S8 info completed. 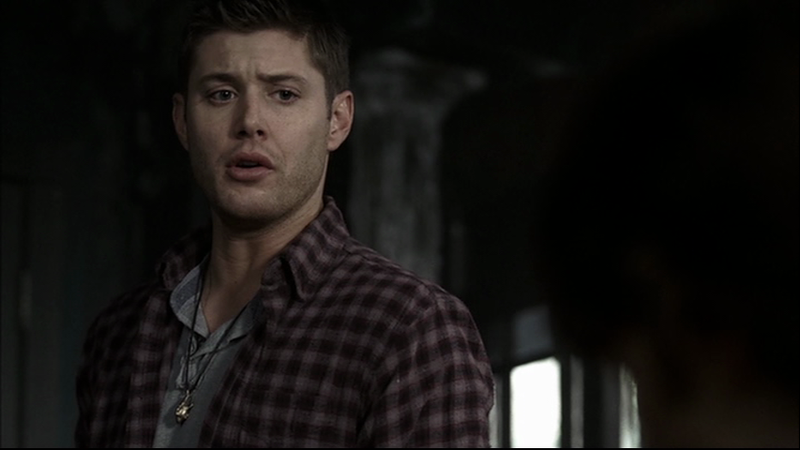 But, Dean also wears this shirt in Everybody Hates Hitler, briefly. Hey, does anyone know where i can buy one of these or one like this as I would like to wear it to cosplay day at school. Unfortunately, I have no idea. A few friends have tried to track it down and failed. My suggestion would be to go to your local thrift store and see if you can find something similar, even if it's not the same.